For every intention tree purchased, a live tree will be planted! Heal your spirit with affirmations and plant a live tree! Comes with an attractive packing slip that lists the gemstone used and declares that a live tree is being planted because of this purchase! 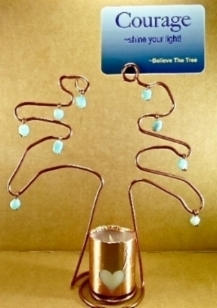 Each Intention Tree is uniquely handmade with genuine 10 gauge copper, and expresses the uniqueness of our live trees. Copper Properties: an orange metallic ore. Can ease joint pain, increases self-esteem and self-awareness. Helps establish emotional boundaries. A packing slip lists the gemstone used and declares that a live tree is being planted because of this purchase! Semi-precious gemstones hang from the branches. Read about the healing properties of gemstones HERE. The tree is designed to hold affirmation cards that have powerful messages with positive energy. Purchase a deck- (click the SHOP NOW! button to go to the store)- 10 affirmation cards per deck. The optional LED deluxe tea lights look nice sitting at the bottom, especially turned on in the dim or darkness. These tea lights are wrapped in real conductive copper tape. Every Intention Tree is unique, just as our live trees are. Order yours today! Make a purchase - planT a tree! 3) choose a tea light.